Friday, John Robert Wiltgen Design, Inc. was honored to receive two awards from the Home Builder’s Association of Greater Chicago. We accepted a Gold Key for a home we created for a prominent Gold Coast socialite who asked us to remodel her third residence at The Carlyle. While preserving her larger than life reputation for elegance and impeccable style we worked diligently to design something timeless. Incidentally The Carlyle is former Mayor Richard M. Daley’s new address. The walls are finished in a custom waxed Venetian plaster finish. We installed new floors stained charcoal and updated pieces from our client’s private furniture, art and accessories collection. Yet, we made certain her unique sense of humor prevailed. Our challenge was two-fold. She needed help de-accessioning some of her possessions, and creating as much space as we could to replace a portion of the 75 linear feet of storage that existed in her former home at The Carlyle. We designed a custom 9-foot long two tier Selenite chandelier to compliment the architectural detailing of the tray ceiling in the foyer. 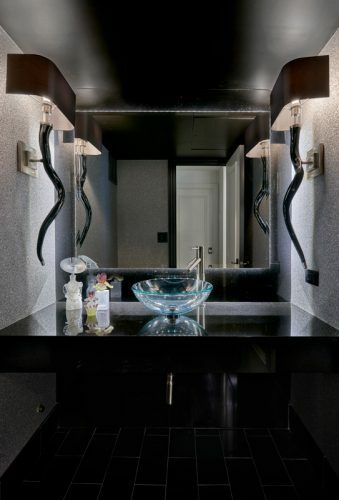 A blacksplash, floating backlit mirror and sconces add drama to the powder room’s existing glass bowl and countertop. The former dining room was given new life as a library; it has become the owner’s favorite spot. Formerly a non-descript office chair from her previous study, it embraced a stylish new identity once it was wrapped in fur. The kitchen table is cleverly built into the window sill to graciously capture space as well as the gorgeous view of the lake and East Lake Shore Drive. Our client is a meticulous fashionista who needs an abundance of wardrobe space. So, in her bedroom, we created a wall of cabinetry with silver leaf center panels and illuminated on the inside with LED lights. Our second award is the Home Builder’s Association’s coveted Crystal Key for a home at 2550 Lakeview, Lincoln Park’s elegantly gracious crown jewel. We refined an erudite, well-travelled couple’s Chicago home with personal touches reflecting their cultured lifestyle. 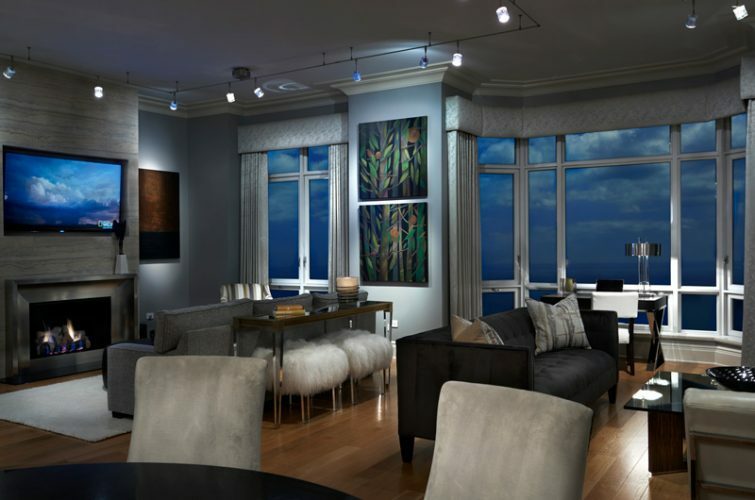 It is the second award winning home we have created in this luxurious residential tower. 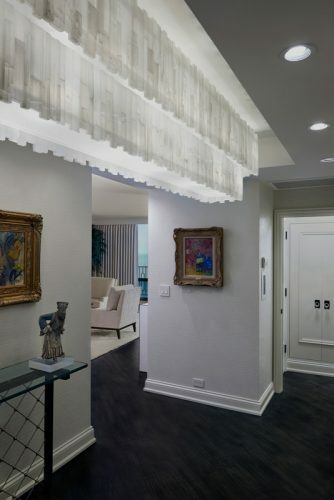 We removed several vestibules from the entry and modified the lighting to create a dramatically illuminated gallery that effectively showcases our clients’ art. The fireplace we designed was clad in silver travertine and is especially suited to the large salon which features a pair of paintings by the owners’ daughter. 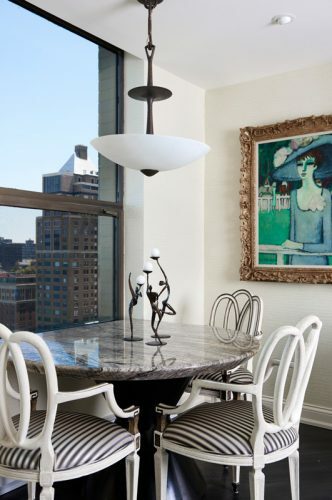 Many of the furnishings and accessories from the family’s private collection enhance the room’s openness. Since the dining room’s concrete ceiling could not be channeled, we created a medallion to house the electrical connection enabling the chandelier to be moved to the center of the granite top table. 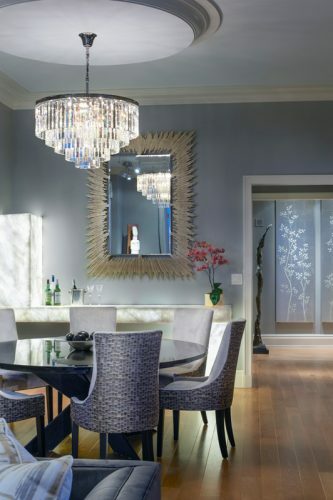 The backlit quartzite server enhances the dining room’s ambient lighting. 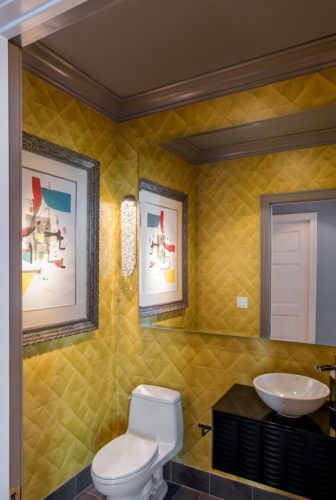 Wallcovering that appears three-dimensional gives the powder room a tactile “quilted’’ look (everyone has to touch it) providing an interesting backdrop for the owners colorful Miro painting. This has turned out to be another extraordinary year for us. A rousing thank you to all of our clients who believed in John Robert Wiltgen Design, Inc. and allowed us to transform their homes into works of art. And our heartfelt thanks go out to those of you who referred us to new clients. We appreciate your confidence in the JRWD team.